See You Later Alligator – Welcome to InflatedStory.com! Knowing I had nearly made enough animals for this Inflated Story, I set out in fall 2015 to make a final sculpting push. Even though more international trips were unlikely, I wanted to make the final sculptures special. Fortunately, the United States of America is an incredibly diverse place, and the Everglades beckoned from the southern side of Florida. But who would I make such a crazy balloon sculpting journey with? Fortunately, I have three homeschooled nephews who were up to the task and able to take the days off. With a car full of balloons and a cooler to fill with ham and cheese, we hit the southbound highway. Our travel weather was beautiful until we were very close to our southern Florida base camp, a Best Western in Homestead, FL. Then it got ugly. A radar map of the entire country showed rain on the west coast with otherwise sunny weather across the central, northern, and southern United States—with one exception, the southern tip of Florida. My vague and likely inflated (no pun intended) aspirations to photograph balloon fish while snorkeling in the keys were dashed by the foul weather which made our Friday a scouting day. First, we checked out the Everglades—I’ve never been so fond of 25% deet mosquito repellent. On our way out of the park, I saw a sign for “Everglades Alligator Farm”. I hadn’t mapped it yet, but I was almost certain this was the alligator farm I had been checking out on the internet. This was one of the more fortuitous moments in making the book because it allowed me to meet some folks at Everglades Animal farm in person before I showed up with balloons trying to take photographs. They had agreed to have a handler meet us first thing Saturday morning. That night I set to sculpting at the hotel. Alligator one was the largest alligator and took around two hours to complete. I sculpted in the hotel room while my three nephews watched and chilled on the internet. When it was time for them to get some rest, I made sure they were secure and headed to the lobby for alligators two and three. The second gator I began was the one I see as the mother. She was tricky to twist because I felt unsure how the two-tone weave might turn out. In frustration, I set her aside while I sculpted the baby alligator with his mouth open and ready to bite—though in my imagination the little one is just feeling chipper. Not surprisingly, I made a few new friends and balloon book fans while sculpting in the lobby. Finally, exhausted but satisfied, I was able to tidy up, clean up, and get some rest. Saturday morning, I set my action cam rolling as we traveled toward the Alligator farm. Eventually, you will get the see my balloonumentary of the process. When we arrived at the Animal farm, the two handlers, Will and Luke, were absolutely amazing. I hoped to get a decent shot with alligators in the distance. They walked into the alligator holding pond with me, lured startled alligators back to shore, and allowed me to get pictures within feet of the giant reptiles. Needless to say, I was a big nervous—but these guys clearly knew what they were going. Will even coaxed an alligator that must have been 14 feet to raise up with his jaw dropped for some pictures. After we finished in the main pond, they took me over to the baby gator holding pond for pictures with the little ones. Once again, I was allowed to climb into the holding area. Luke was actually walking around in the water barefoot to keep the little ones in control! One of my favorite moments of the day was when a curious gator toddler walked right up to the balloon gator and gave it a nip. Fortunately, the balloon did not pop and the alligator was not harmed. It made for a great picture! I will always be grateful to the Everglades Animal Farm for the kindness they showed me, my project, and my nephews. My youngest nephew Andrew had his birthday that day, while we were traveling, and I was a bit worried about him having to celebrate away from his parents. Thanks to the folks at Everglades Animal Farm, I think it was his most memorable birthday ever. Luke caught us just before we left and asked if we had time for a treat for my young nephew’s birthday. He took us back to a new exhibit that was not opening until later in the day and let my nephews feed alligators! Apparently, the only other outsider they had ever let feed the adult alligators was Shaquille O’Neal. With the alligator farm behind us, I wanted to be sure we had a few pictures that were actually inside the Everglades. We took the alligators on into the park, first getting a few fun shots at the edge of the Anhinga trail before driving a big further west and getting a few shots with the miles of sawgrass. Finally, having dodged more mosquito bites than we took, we loaded the alligators into the car and called it a day. Mission Complete. 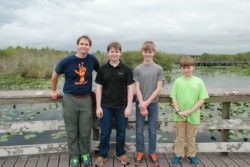 Of course, you can’t travel across the state of Florida with a crew of 11-16-year-old boys without stopping for a few bonus adventures. Along the way we saw the Kennedy Space Center (you’ve got to see the Atlantis exhibit! ), drove into the Keys (despite the icky weather), wandered through Wonderworks in Orlando, and swam with manatee. By far, though, our experience photographing alligators at Everglades Alligator Farm was the highlight. I look forward to the day you see the final product in The Inflated Story of Noah. If you enjoyed hearing about the alligators, be sure you check out the alligator balloonumentaries!